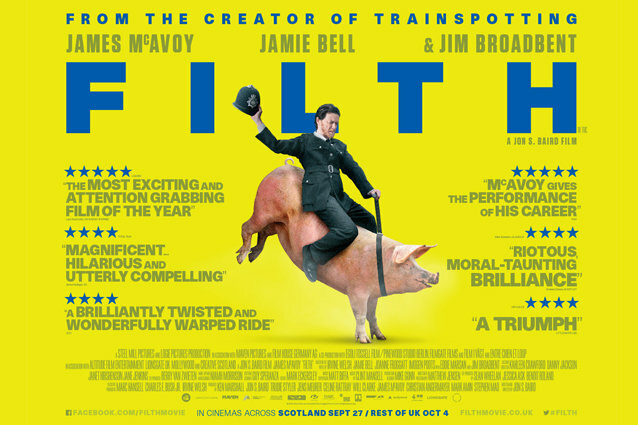 There’s a new red band trailer out for James McAvoy’s Filth, and it’s even stranger than the last one. The first 10 seconds alone show a montage of things that are so weird I’m not sure I even saw them correctly (some kind of giant, toothy worm?). But all the craziness just makes me even more excited for this film. McAvoy stars as Bruce Robertson, a Scottish police officer who spends more time breaking the law than upholding it. He does too many drugs, takes womanizing to a whole new level, and is generally just insane. Eddie Marsan, Jim Broadbent, Jamie Bell, and Imogen Poots are all lined up to support McAvoy in this adventure adapted from Irvine Welsh’s novel. Filth opens overseas on September 27, but there’s currently no domestic distributor or release date. Hopefully we won’t have to wait too long, but in the meantime, check out the nutty red band trailer.